This article is about the Balloon Fight arcade game later released for NES. For information about the Game & Watch game, see here. 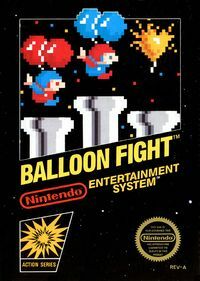 Balloon Fight is a platform arcade game released in 1984, as the Nintendo VS. System arcade machine VS. Balloon Fight, and later ported to several systems, chief among them the NES. In 1990, a sequel for the Game Boy titled Balloon Kid was released, which took the concept and turned it into a full adventure game. The NES version of the game would also later be ported several times. You'll need lightning-fast reactions to win this battle in the sky! Take to the skies! It's BALLOON FIGHT. You'll score lots of points and have loads of fun when you burst enemy balloons and send their parachutes crashing into the sea. But beware. These hot-air invaders have an amazing ability to land safely, blow up another balloon and come back stronger than before! What's more, if you fly too low you'll be devoured by a man-eating shark! Challenge them alone if you think you're up for it, or team up with a friend. Either way, you'll have the time of your life fighting off your opponents in the sky and avoiding those hungry sharks below in BALLOON FIGHT! Controlling a character to pop your opponents’ balloons before they pop yours sounds easy, doesn’t it? Don’t be fooled by this game’s simple premise or cute exterior, though–underneath these you’ll find a surprisingly addictive game with strategy to spare. After mastering the easy-to-learn controls, you still have to get a grip on the game’s impressively realistic physics. And if that’s not enough, there are still the ever-increasing enemies and environmental hazards like lightning and water. Or try the game’s second mode, Balloon Trip, if you feel like taking a break from the action and just want to see how long you can stay aloft. And hey, who doesn’t like popping balloons sometimes? Controlling a character to pop your opponents’ balloons before they pop yours sounds easy, doesn’t it? Don’t be fooled by this game’s simple premise or cute exterior, though–underneath these you’ll find a surprisingly challenging game with strategy to spare. After mastering the easy-to-learn controls, you still have to get a grip on the game’s impressively realistic physics. And if that’s not enough, there are still the ever-increasing enemies and environmental hazards like lightning and water. Or try the game’s second mode, Balloon Trip, if you feel like taking a break from the action and just want to see how long you can stay aloft. And, hey, who doesn’t like popping balloons sometimes? Maneuvering an airborne character to pop your opponents’ balloons before they pop yours sounds easy, but don’t be fooled by this game’s simple premise or cute visuals. Underneath these elements you’ll find a surprisingly challenging game with strategy to spare. After mastering the easy-to-learn controls, you'll still have to get a grip on the game’s impressively realistic physics as you to face ever-increasing enemies and environmental hazards like lightning and water. Take a break from the action and play the game’s second mode, Balloon Trip, to see how long you can stay aloft. Controlling a character to pop your opponents’ balloons before they pop yours sounds easy, doesn’t it? Don’t be fooled by this game’s simple premise or cute exterior, though–underneath these you’ll find a surprisingly challenging game with strategy to spare. After mastering the easy-to-learn controls, you still have to get a grip on the game’s impressively realistic physics. And if that’s not enough, there are still the ever-increasing enemies and environmental hazards like lightning and water. Or try the game’s second mode, Balloon Trip, if you feel like taking a break from the action and just want to see how long you can stay aloft. And, hey, who doesn’t like popping balloons sometimes? Maneuvering an airborne character to pop your opponents’ balloons before they pop yours sounds easy, but don’t be fooled by this game’s simple premise or cute visuals. Underneath these elements you’ll find a surprisingly challenging game with strategy to spare. After mastering the easy-to-learn controls, you'll still have to get a grip on the game’s impressively realistic physics as you to face ever-increasing enemies and environmental hazards like lightning and water. Take a break from the action and play the game’s second mode, Balloon Trip, to see how long you can stay aloft. The game has the player controlling the Balloon Fighter as he freely maneuvers around the stage, pressing the A or B buttons causing him to flap his arms and gain altitude. There are two basic modes: the 1/2-player game, and Balloon Trip. In the main game the goal is to defeat all the enemies on-screen by popping their balloons while trying to keep them from popping the fighter's two balloons; one balloon is popped for each hit. Players also lose a life instantly by falling into the water, being eaten by the fish, or is hit by lightning from the clouds on the stage. The goal of Balloon Trip is go travel as far as possible along a never-ending stage, dodging as many obstacles and popping as many balloons as possible; the player is also only given one life to do this. Balloon Fight Arcade (Nintendo PlayChoice-10) 1985 A direct port of the NES version of Balloon Fight. Balloon Fight Sharp Zaurus 2001 A version of Balloon Fight. Balloon Fight-e Game Boy Advance (e-Reader) 2002 A port of the NES version of Balloon Fight. The game is contained on five cards, which must all except for one be scanned twice (as four of the cards feature two barcodes). Balloon Fight Wii (Virtual Console) 2007 A direct port of the NES version of Balloon Fight. Balloon Fight Nintendo 3DS (Virtual Console) 2011 A direct port of the NES version of Balloon Fight. Balloon Fight Wii U (Virtual Console) 2013 A direct port of the NES version of Balloon Fight. This page was last edited on 23 March 2019, at 17:56.